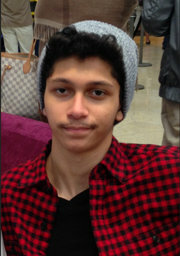 Pictured is Ali Amin, a 17-year-old from Virginia, who was sentenced to 11 years in prison after pleading guilty to material support for a terrorist group. You can read his story by clicking this link. The story appeared in the December 8, 2015 edition of The New York Times, and was titled, "Americans Attracted to ISIS Find an ‘Echo Chamber’ on Social Media." I was attracted to the story not by the topic, which is an important one, but by the "pull quote" I saw in the middle of the page. What Amin said, it strikes me, applies to all sorts of political involvements, and he "echoes" what I have been saying about the Internet. Political engagement online is not going to be sufficient to help us restore democratic self-government to the United States. By assimilating into the Internet world instead of the real world, I became absorbed in a ‘virtual’ struggle while disconnecting from what was real: my family, my life and my future. Our political engagement has to be with "real" people. How does it go? What do they say that those politicians are always doing?